I get incredible letters. It might be from a child who loved a picture book, or a boy who got turned on to reading through Jigsaw Jones, or a baseball nut who loved Six Innings. 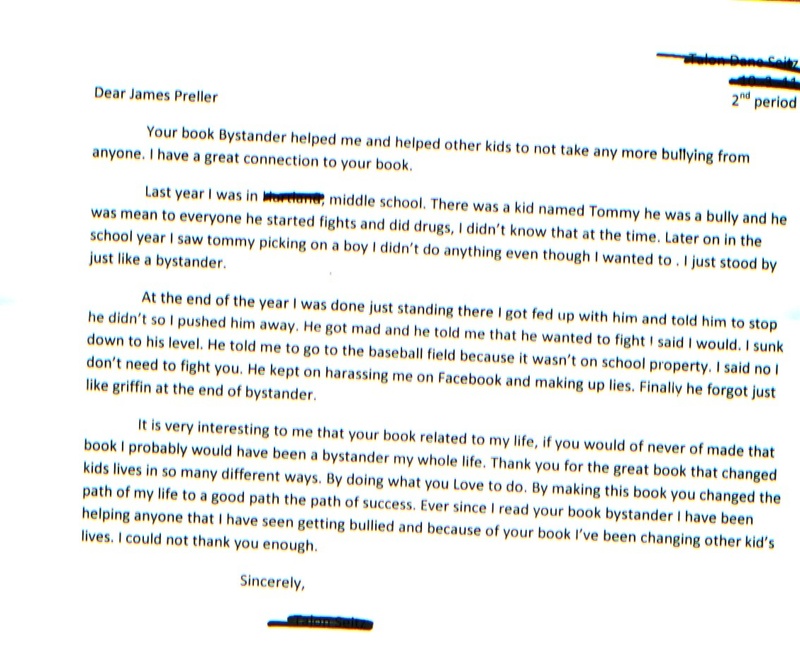 But more and more, I get letters in response to my book, Bystander. The senders of these missives are older than most of my readers in the past. They write longer, with more skill, more depth, and often with more feeling. This week, because I’m on the road visiting schools for ten days (OH, NJ), I’m going to pass along of few in succession, just to give you a taste. As always, simply click on the letter to make it larger for readability. I don’t like to begin my letters with an apology, but sometimes it’s necessary. I’m sorry for the lateness of my response to your letter. Please don’t get the idea that I don’t appreciate what you did, or the things you shared about your own experiences at _______ Middle School. Writing can be lonely work. It’s mostly done in a quiet room, scribbling words on a blank page. Likewise, reading is also a thing done in isolation, often in silence. And yet here we are, you and me, miraculously connected through the written word. Aren’t books incredible? You as a reader can feel that connection with me, and with so many other writers from all over the world . . . and from hundreds of years ago. Wow, when you think about it, just wow.